discovering how "living" networks of reactions can develop from abiotic mixtures of chemicals. We are constantly looking for hard-working early-career scientists to join the team! 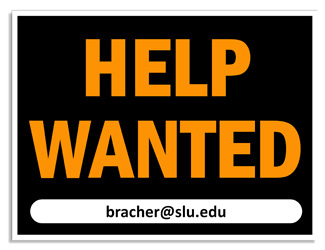 Undergraduate students at Saint Louis University who are interested in conducting research for credit or as an extracurricular activity should contact Paul by e-mail. There is a formal process for matching with a lab that is described on the chemistry department's Web site, and space in the research group is not unlimited. Most students do not begin research until they have completed organic chemistry. Paul is happy to talk with prospective students (and provide one of the required signatures for their green Mentor Request Forms). Students interested in joining the lab to conduct research leading to M.S. or Ph.D. degrees should contact Paul by e-mail for more information. Prospective students must apply to the graduate program in chemistry at Saint Louis University. Anyone interested in joining the group as a postdoc should contact Paul for information about potential projects that can be used to write proposals for external fellowships.